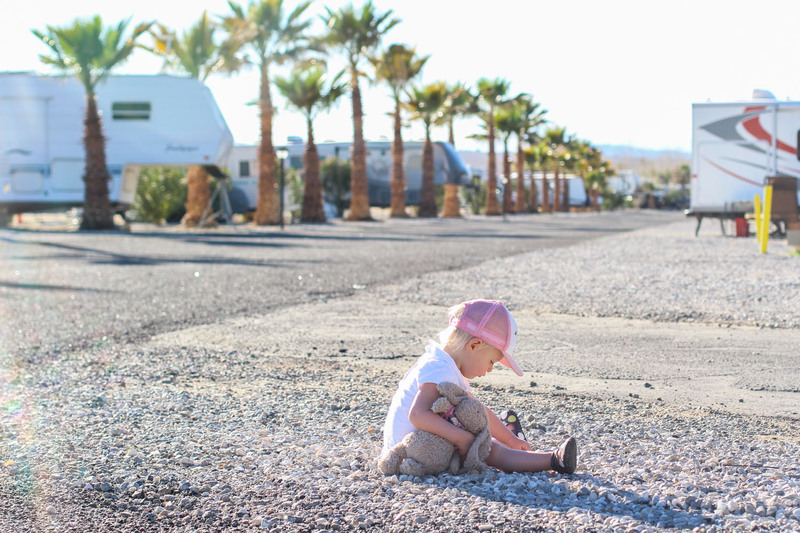 Well, we left our Palm Springs RV resort silently, and without a fight, when we moved north to 29 Palms. A dusty little one horse town, with 18 tattoo parlours, at least as many liquor stores, half as many marine barbers, and zero coffee shops. At least that we could see. For every 2 or 3 vacant lots or vacant buildings there was a business. In between, the sandiest, dusty wasteland complete with tumbleweeds. Can you tell I’m not a huge desert fan? If you open your mouth for one second, it dries out. It was literally parching, at 30 degrees. At night down to 7. Volvo meets train. Custom job driven by a stuntman. Why did we come here you ask? To see Joshua Tree National Park, of course. Which is very beautiful, in its own desert way, and so different from anything we’d really seen before. On our first day of hiking we did the 29 Palms Oasis which is a 3 mile round trip up a mountain, down the other side and into a cool gully lined with palm trees. I always thought an oasis was like a mirage, it didn’t exist, but we saw it with our own eyes. Josh carried Rylie for the whole journey, and lucky for us it wasn’t too hot, and she was a good sport about being in the backpack for nearly 2 hours. She also briefly fell asleep in the most awkward cockeyed position, with head falling out to the side with her face up. Once again she was popular on the trail as the “youngest hiker we’ve seen!” and “oh, there’s a real baby in there!” (which is my personal favourite). Joshua Tree. Yeah its ugly. On the second day we did a shorter Hidden Valley loop, at just 1 mile long, it was nice and casual. We let Rylie out of her backpack and she proceeded to climb every rock, and ride every log along the way. That only lasted about 200 meters though, as we would be there all week at that pace. With a snack to bribe her back into the sack, we finished up before the sun was too hot and the bellies began to grumble. It was pretty, and much different than our journey the day before. From there we drove up to Keys Ridge which had an awesome 180 view of the valley below, including the entire Palm Springs area, and of course, complete with some not-so-lovely smog from L.A. It was a quick 3 night trip, and we didn’t sleep that well the whole time, as the little one is currently cutting four teeth, and they are monsters. She’s been up way later than normal, and fighting bedtime with a vengeance. At this rate, the poor thing should consider stocks in tylenol. Keys Ridge. Down below is Palm Springs. Under the snowy mountain. family shot… in front of rocks. We were supposed to head to Lake Havasu for a couple nights, but the campgrounds were full, then Yuma to follow. We changed our plans again, and headed straight for Oceanside because if Yuma won’t take babies (or under 55), then we won’t have Yuma. It’s nice to be back by the sea anyway, with the friendly faces we’ve grown to know over the past few months, its like our home away from home, in our home. We certainly will miss not having our close friends here this time, as they have gone back to Canada, but funny enough, there was one campsite left today when we arrived, and it was theirs. Good old site 88. After hooking up, setting up, and chatting with the neighbours we did a little beach street walk for old time sake. Goodbye Cactus. Hello Ocean.